If you are visiting Tuscany and you make your way to Siena, don’t miss the exclusive exhibition in the Cathedral of Siena running from March 1st through to August 31 which hosts the sublime masterpiece by Tiziano “The Baptism of Christ” . To celebrate the 500th anniversary of its creation, the painting for the first time in history travels out of its permanent exhibition space at the museum Pinacoteca Capitolina in Rome to Siena to mingle with the works present in the Crypt of the Dome. This latter works were only discovered in 1999 during the restoration of the Cathedral, found below the altar in a crypt of 180 sq.m. The fresco paintings which depict the history of the Old and New Testament have been dated back to the 13th century. These are really valuable works attributed to Diotisalvi di Speme, Guido di Graziano and Rinaldo da Siena, artists that lived in Siena during the 13th century. We highly recommend visiting the crypt just to see these works, with the added Tiziano it becomes a must stop when you’re in Siena! 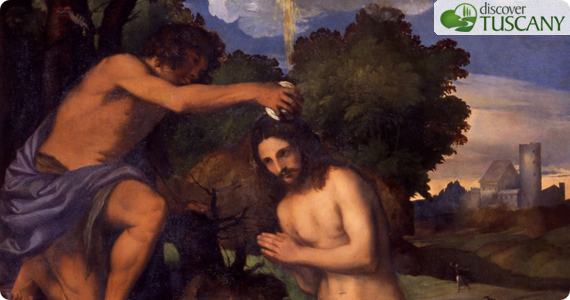 The “Baptism of Christ” by Tiziano represents Jesus Christ in the act of being baptized by John the Baptist. In the painting, Giovanni Juan Ram, the Spanish man who commissioned the work, is also depicted in the lower right. Details on his person allude to his life: the second wedding ring on his little finger symbolizes the death of his wife, while the woodpecker probably represents recovered health after the bubonic plague that passed through Venice in 1510. Because of its similarity with other important works by Tiziano, The Three Ages of Man, Sacred and Profane Love and Noli Me Tangere, the Baptism of Christ has been dated back to 1511-1513. The exhibition is open every day from 7.30 am to 7 pm (last entry at 6.30 pm), with entry ticket costing € 8 while the visit is free for residents. We highly recommend you visit this gorgeous itinerary through art and religious faith, hosted in one of the most beautiful cities in Tuscany. 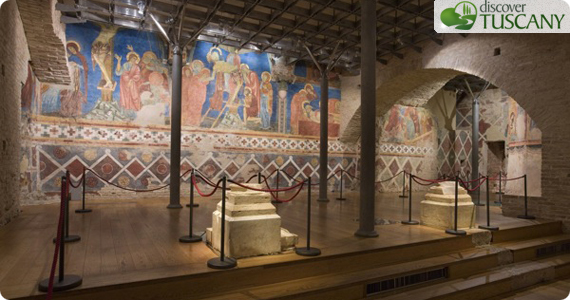 To get more information about the Crypt and the Exhibition, see the Duomo of Siena’s official web site. Is the mystery of the Battle of Anghiari finally revealed?